Reproduction standard hood spring used on all Standard Hoods. Reproduction license plate bracket for 1970-73 Camaro standard models. This bracket mounts to the front valance and the license plate is mounted to it. Manufactured in stamped steel to factory specifications for an authentic appearance. License plate screws and insert nuts not included and are sold separately. For standard model front end only. Replace your original style black fender to radiator support bars with these black bars. They install from the fender to the radiator support on each side under the hood. These bars when installed, will help to keep the front sheet metal from flexing. These die stamped filler panels are manufactured like originals and fit both Standard and Rally Sport models. The bumper filler fit between the fender, lower valence and header panel and take up the space between the body and the bumper. Reproduction flat hood insulation for use on all 1970-81 Camaro with a standard hood. Its made of a heat resistant material which will help to protect the paint on the hood from the engine compartment heat. NOTE: Intended for use on 1970-77 Camaros but will work on 1978-81 Camaros with slight modifications. Will not work on 1980-81 Camaros with Air Induction Hoods. A correctly stamped front fender patch panel which installs on the rear lower fender area. Each panel will replace the rear lower section of this commonly rusted rear area. Each panel is approximately 16" high x 20" in length. Replace your original style black fender to radiator support bars with these polished chrome bars. They install from the fender to the radiator support on each side under the hood. These bars when installed, will help to keep the front sheet metal from flexing. Comes with chrome mounting hardware. This is a quality reproduction made to original specifications of the 1970-73 Camaro hood latch support. It is located between the grille and the radiator support. Fits standard or Rally Sport models. Reproduction headlight mounting bucket for all Standard and Rally Sport 1970-73 Camaro models. Design to hold the headlight beam and attach to the headlight housing using the adjustment screw and nut assemblies. We recommend using a new headlight adjustment kit installing a new mounting bucket. Reproduction headlight mounting bucket LH/RH for all Standard and Rally Sport 1974-81 Camaro models. Designed to hold the headlight beam and attach to the headlight housing using the adjustment screw and nut assemblies. We recommend using a new headlight adjustment kit installing a new mounting bucket. Units sold separately. Reproduction of the inner fender to firewall brace that bolts between the rear inner side of the inner fender and the firewall. Reproduction headlight housing for all Standard and Rally Sport 1970-73 Camaro models. These housings attach to the radiator support and hold the headlight components in place. Reproduction hood hinge for use with all 1970-81 Camaro/Firebirds. Hood hinge only, spring sold separately. Reproduction cowl vent screen for all 1970-81 Camaro models. Mounts to the top of the upper cowl panel. Manufactured from injection molded plastic just like the original. Quality reproduction of the original hood latch assembly for 1970-73 Camaros. For us with all 7-73 models except "RS" models. Installation kit to install fender louvers for all Z28 models. Kit includes (2) Plastic Gaskets, (2) Metal Brackets, (2) Retainers and (12) Nuts. Lower front fender extension without holes for front fender flare. Lower front fender extension with holes for front fender flare. Quality reproduction of the original hood latch assembly for all "RS" model 1970-73 Camaros. We offer the finest quality inner fender available for 1970-81 Camaro models. 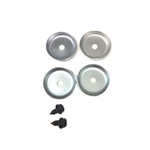 Each inner fender installs like original and includes correct mounting holes for all models. On 1970-76 models it may be necessary to drill 3 holes to attach the fender skirt brace using the original brace as a guide.